150 W High Efficiency Primary Side Regulated DCM/CCM Flyback Supply Reference Design. Together, these two reference designs reduce audible noise, increase energy efficiency and meet EMC/EMI and safety requirements with lower costs for major home appliances. TIDA-00447 is a 24V, dual Brushless DC (BLDC) motor drive reference design to be used in major home appliances to drive low voltage BLDC motors such as pumps and fans, e.g. for circulation pump and drain pump of dishwashers. The power stages of motor drive are designed for 100W and 30W of continuous operation respectively. The 30W drive is based on a single chip, low external component count three-phase motor driver with integrated power MOSFETs and offers proprietary sensorless control scheme to provide continuous sinusoidal drive. It also features an integrated buck/linear regulator to efficiently step down the supply voltage to either 5 or 3.3 V for powering both internal and external circuit. The 100W drive is implemented using discrete approach having an MCU, external MOSFET driver with protections & current sensing and external power MOSFETs. This architecture offers the flexibility to scale the drive power level as needed. 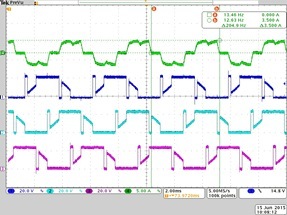 The MCU is programmed with InstaSPIN-BLDC software that implements sensorless trapezoidal control of BLDC motor using back-EMF integration method and it is also used to configure & control the speed of drain pump stage. Isolated UART interface enables communication of the drive unit with the main user interface controller. 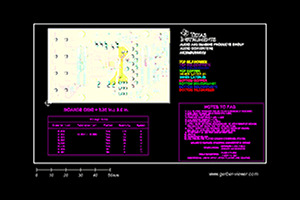 This reference design is fully tested for full load operation, over current and motor stall protections. 24V dual brushless motor drive platform for major home appliances using devices with extensive built-in protection features enabling safer, noiseless operation and small form factor. The lower powered motor drive is thermally designed for up to 30W continuous operation is based on a single chip, low external component count three-phase motor driver with integrated power MOSFETs and offers proprietary sensorless control scheme to provide continuous sinusoidal drive. The lower powered motor drive controller integrates 5V/3.3V buck/linear converter and protection functions such as over current, voltage surge protection, UVLO protection and motor Lock detection. The higher powered motor drive thermally designed 100W continuous operation is implemented using discrete approach having an MCU, external MOSFET driver with built-in protections & current sensing amplifier and external power MOSFETs. The discrete implementation of water circulation pump offers flexibility of easily scaling up or scaling down the power level. 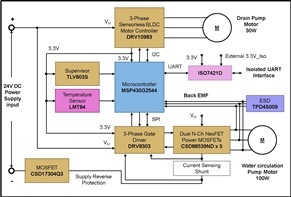 The MCU is programmed with InstaSPIN-BLDC software that implements sensorless trapezoidal control of BLDC motor using back-emf integration method offering robust low speed operation and finer control over the entire speed range.